The long awaited documentary chronicling the exploits of Bob and Kathy Burns is finally here ! Co- producers Frank Dietz and Trish Geiger,have done an amazing job on this labor of love for a great many of the fans and friends of Bob and Kathy. They are having the premiere screening at the ArcLight Cinema in Hollywood on April 12th. Tickets are available at www.creaturefeatures.com. Frank and Trish will provide info for DVD sales as soon as it is available. The special guests are a veritable who's who in Hollywood, featuring some of the finest the movie industry has to offer. See above for a few of the guests. 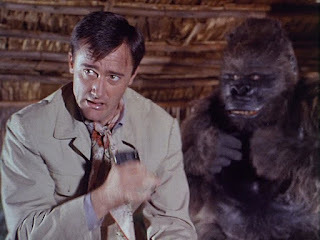 Besides being the most beloved gorilla man ever, Bob is the worlds foremost historian of cinematic simians. Gorilla man and myself have have invaluable information of the historic gorilla men given to us by Bob, and through Bobs generosity, we pass the information on to you, the readers of this humble blog. A huge thanks to Frank and Trish for making this awesome film happen ! Calvert and Corrigan doin' the jungle boogie ! 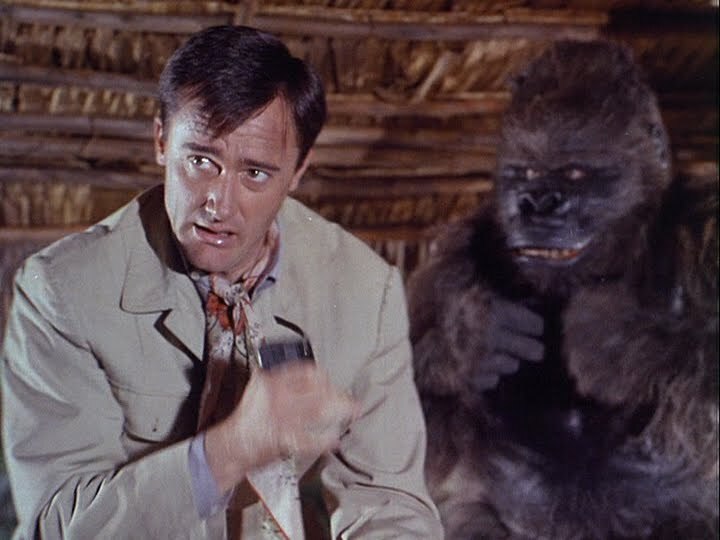 Our friend Doctor Kiss has outdone himself with his amazing discovery of stock footage reels of Steve Calvert, and possibly Ray Corrigan ( or at least Corrigan's ape suits), doing pass after pass in front of the cameras from either Jungle Jim's, Mark of the Gorilla , or the Lost Tribe. It becomes humorously apparent that the two monkey men are running in a circle around the camera, in the first clip. While the second clip features Calvert VS. a lion in a fierce battle to stay awake long enough to get the shot. The poor lion even lies down after his first sniff of Calvert's suit. Old Leo mustered up enough energy to prop himself up on furry adversary to get some semblance of combat. It goes to show how skilled film editors can turn a feline snooze fest into a terrific battle ! The truly amazing thing about these clips, is the clarity of the film. I've never seen such clear footage of these masters of monkey menace ! The gorilla footage in the first clip start at approx. the 6 min. 28 second mark. Both these incredible clips are found on Internet Archive, and can be downloaded from there. a detailed article about gorilla men can be darned difficult....Well, outside of this blog that is ! 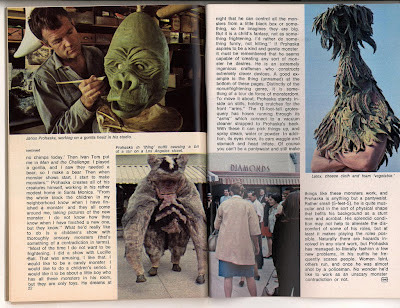 I found on ebay recently, a 3 page article on gorilla man and creature creator Janos Prohaska. 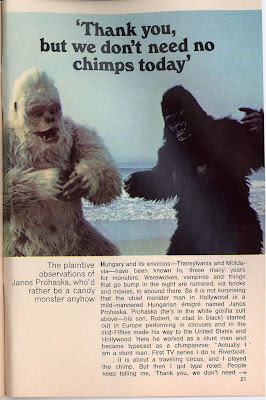 It was featured prominently in the pages of TV Guide is the Jan. 25th-31st, 1969 issue. 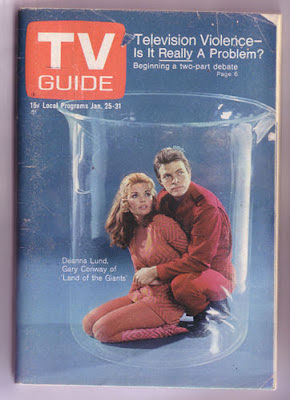 The TV Guide was purchased for the Prohaska article, but as I flipped through the pages, I was transported to an awesome time when Lost In Space, Bonanza, Time Tunnel ,Batman, etc. were the current prime time programing. It was quite surreal looking into the past, the ads were especially insightful to the current fads and cultural habits of the time. The cigarette ads would be banned from publications a few years later, but were fascinating never the less. But I digress, so without further ado, here is the article...ENJOY !!! Click here for larger views. I'll be a monkey's U.N.C.L.E. ! Uncle agent Napolean Solo about to get one heck of a surprise , in the classic Man from U.N.C.L.E. episode, "The My Friend The Gorilla Affair". 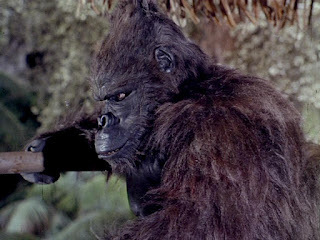 The episode features big George Barrows as a gorilla named "Baby". The episode also features the stunning Vitina Marcus as the jungle girl that Baby protects. Ms. Marcus's most famous role is "Athena", the Girl from the Green Dimension from "Lost in Space ". 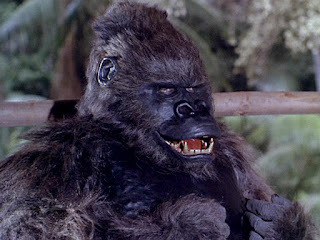 You get to see George's gorilla suit quite well in this episode, as all his scenes were in full light. You can see all the fantastic detail George built into his incredible suit. 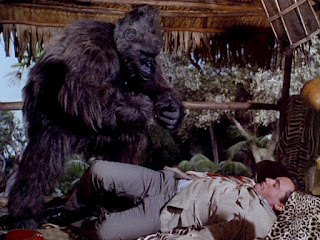 George Barrows was one of the most memorable gorilla men ever. His suit was instantly recognisable in any film or TV show he ever appeared in. Why it's good to be an Ape ! There are few things more satisfying to a gorilla man, than the effect all that simian mojo has on a beautiful girl. The stunning Sofia Vergara fell for some good old gorilla charm, and wound up in the loving embrace of a lovestruck gorilla ! Damn, I envy the lucky S.O.B. in the ape suit in the photo here ! The photo shoot video is found here !